The BookMates have been discontinued at the original website. They are now sold at BookmatesPlus. I have updated the below links accordingly. 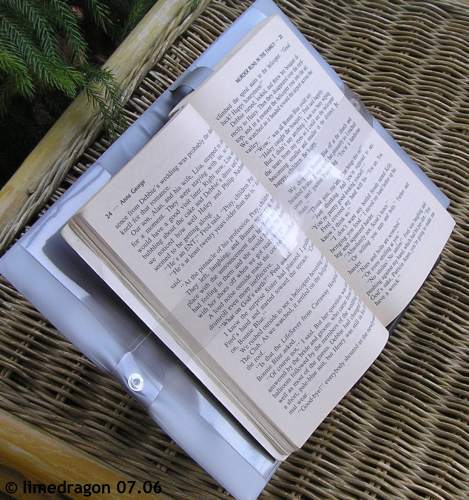 BookMate offers an eponymous book holder in several versions. Each is designed for a certain book size: BookMate I for mass paperbacks, BookMate II for trade paperbacks and small hardcovers, and BookMate III1 for hardcovers. BookMate I & II are book covers, but they also keep the book open when desired. The prices range from $11.50 to $22.49. A Mini-Rest stand is available separately ($7.75), or you can use your own stand, flat surface, or pillow, for hands-free reading. The cover is composed of vinyl or plastic. The BookMate I has the largest selection of cover colors and designs, including solids, faux animal skin, patterns, and 3-D. Some of these designs are also available for the BookMate II. (I hesitated on buying the BookMate for a long time because I was not sure I liked the vinyl covers.) 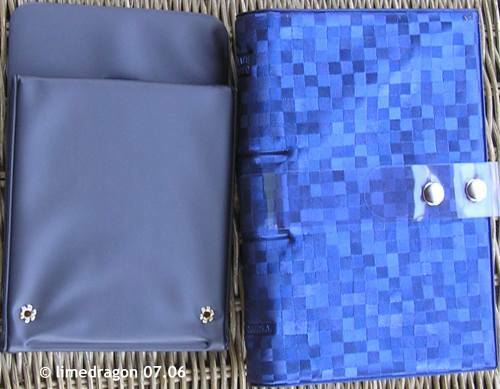 I chose the Sapphire Reflections for my BookMate I and a plain Charcoal BookMate II. Once I had them in hand, I really liked the Sapphire, because it was fun, with a little bit of sparkle. The plain Charcoal turned out better than I expected, with its pearl finish. Click any thumbnail to open a manual slideshow. The interior is a bright silvery-gray (this may vary by cover color) with a matching, integrated bookmark. Transparent pockets at either end hold the book cover in place and prevent the book from falling out. The page strap is a clear plastic strip that can lay across an open book or go around the cover to keep it closed. It attaches to the cover with one of two metal snaps, which allows some latitude for different book thicknesses. This page strap does not distort the text at all. The BookMate Store provides how-to-use demos for four two of their products. The most surprising thing about the BookMate is the E-Z Flex system. The first thing I noticed was the unique internal construction: rigid, yet flexible. The BookMate’s natural state is open and flat (ready for a book). It doesn’t seem very compact at first, but I quickly realized that I could just slide it into a bookshelf when not in use, perhaps next to a book I planned to read soon. Turning pages was easier with this holder/cover than with the others I had tried previously. It took a few moments for me to become accustomed with turning pages while using either BookMate. If you didn’t check out the demos above, here’s how it works: bend the cover slightly�this loosens the page strap�and slide one page to the other side. It takes only a few seconds. Depending on the book’s thickness, it is possible to turn a page without needing to flex the BookMate. I also purchased a Mini-Rest because I thought it might come in handy if I took the BookMate on a trip. It’s lightweight, made of similar material, and stays flat until assembly (with Velcro). It appears a bit flimsy, but so far, it hasn’t collapsed from the weight of any of my books. I took the BookMate I and Mini-Rest on an airplane trip. Everything fit into my purse, and I was able to set up my book on the tray to knit and read for the duration of the flight. While I liked the E-Z Flex page turning system and the variety in cover designs, it’s a bit of a hassle to have to purchase different options. (The BookMate II can accommodate mass paperbacks, but it will be loose-fitting.) Someday, I would like to try the BookMate III (see below); if it works with paperbacks as well as hardcovers, then it would be more universal as a hands-free holder. 1Because I did not purchase the BookMate III, it is not included in this review. But, here’s more information. 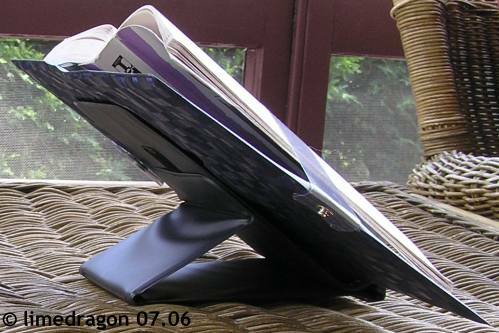 Unlike the BookMate I & II, it is a wide, collapsible stand with page strap. Additional options include an Accessory (to extend its fit for large or wide books, magazines, and newspapers), and an extra-long page strap. The page straps do not use metal snaps, but are adjustable with Velcro. It is available only in Charcoal or Wine. It sounds like a ReadUpon with a strap, sort of? D’oh – thanks for the mention of my pattern! I think I’ll try the Bookmate III right off the bat. Thanks for doing the legwork! The bookmate is the best thing Ive ever found. I love to read. I read in the shower, bath tub, while cooking, drying my hair. Haha. Im a nut but that book mate makes it possible to do anything you want and still read hands free. You can even workout on the treadmill and read. TRY IT!!! This thing is fantastic, I got the book mate 1 and 2 last friday. Since then I’ve read 1-2 paperbacks a day. Before this I’d read two hours and the next day my hand would be sore for 24 hours. Now I dont have to worry about carpal tunnel. Also it doesnt wreck the spine of the book, which is awesome cause I’m a bit obsessive about my books, I like them to look like the haven’t been read….Get it you wont be sorry! I love love love my Bookmates. I have been using them for 15 years. I have tried many other products and none works as well as bookmate. I am so glad there is now a larger size for hardbacks. I usually gift them to friends at Christmas and they always come back to me asking how to get more. Try it, you will love it too!